Any fertile soil that holds moisture well. Young seedlings can tolerate light frost, but the plants are easily damaged by hard freezes. Lettuce, Mizuna, Tatsoi and Endive. This low-growing plant spreads into a mat of green foliage covered with flowers. Grow along pathways or edges of beds, or near tall plants like sweet corn or tomatoes. Sow poached egg plant in early spring, while the soil is cool. Broadcast seed into cultivated soil so that the seeds are about 2 inches (5 cm) apart and one-half inch (1 cm) deep. Thin to 4 inches (10 cm) apart in all directions. Pull up old plants to limit reseeding. Where summers are hot, plants may expire after blooming heavily in spring. The delicate flowers and fragrance of poached egg plant always bring cheer to the garden. Pull up and compost plants when they stop blooming heavily. 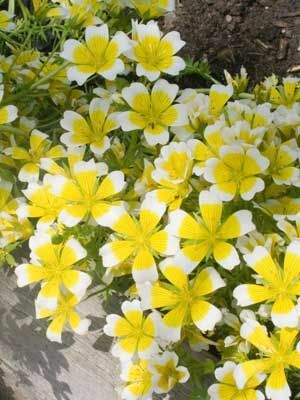 Poached egg plant has few problems with pests or diseases, but may fail when subjected to extreme humid heat.